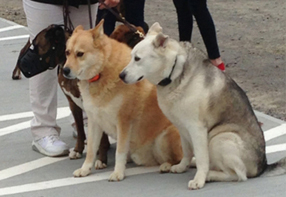 A Tanglewoof, a new dog park, opened at Tanglewood Park on Sunday, May 5, 2013. This dog area is designed for dogs to legally run off leash in a 2.3 acre fenced area. Part of the area is fenced for small dogs and another larger area for big dogs. 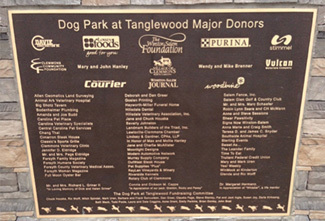 The Dog Park at Tanglewood would not have been made possible without the partnership from generous sponsors and members of the community for their help and support! 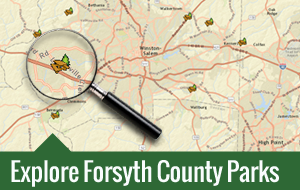 Forsyth County Humane Society organized fundraising initiatives for the dog park and partnered with several members and organizations of the local community to raise funds needed to build the dog park. Visit http://www.forsythhumane.org/tanglewoof/sponsors/ for a complete list of sponsors and community supporters of Tanglewoof. Total funds raised were $178, 000. The off-leash dog area also offers water fountains for people, another fountain bowl for dogs, scattered benches, trash can receptacles, and dog waste stations. The dog park will be free to the public and is located across from the RV Campground at Tanglewood Park.